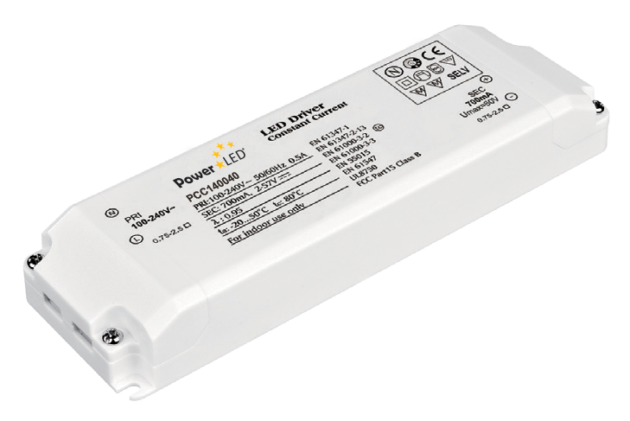 PCC140040 are 100-240VAC constant current LED drivers performing at a 40W power. PCC140040 has an enhanced current range of 1400mA and built in voltage range of 2-28VDC, facilitating your LED lights. Suitable for outdoor, indoor and residential applications. PCC140040 are 100-240VAC constant current LED drivers performing at a 40W power complimenting their long life and high reliability. PCC140040 has an enhanced current range of 1400mA and built in voltage range of 2-28VDC, facilitating your LED lights. The PCC140040’s are also suitable for outdoor, indoor and residential applications.